If you need conex containers in Tacoma, look no further than Haulaway Storage Containers. We offer all major convenient sizes of these steel cargo containers, so that you can rent them with ease and use them for your purposes. Check out our website for a full listing of the conex shipping container sizes that we offer. 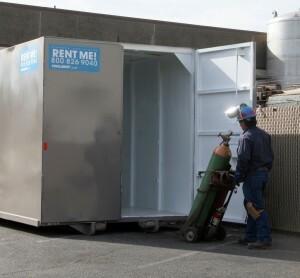 We have both 20-foot and 40-foot containers available for you to rent. Both sizes have double doors on one end for easy loading and unloading or getting into or out of the roll off container. Request a quote today—it is fast and free, and then you will have all the information you need to make a decision when you need to rent a cargo container. Our temporary storage solutions make us the best choice for conex containers in Tacoma. When you rent from us, we will deliver right to your location, and will also pick up the container from you at that same location. Shipping is usually available the next business day, so the shipping containers are ready when you need them. We are proud of the products we rent and the customer service we offer. Call us today and find out about the possibilities for storing materials at your job site in a convenient and temporary way. There are countless uses for our storage containers that make us a great choice for different industries and people. If you have stuff you need to store, we’re right for the job.